ONE. My mom and I took Mac on the Polar Express train this past week and it nearly blew his mind. We told him that day we were going on an adventure to the North Pole and he was so incredibly excited about it. He loved the train ride, the hot chocolate and Santa. But most of all, he loves that bell. It hasn't left his hand in a week and he constantly rings it and says, "I believe, mama." Melt my heart. TWO. 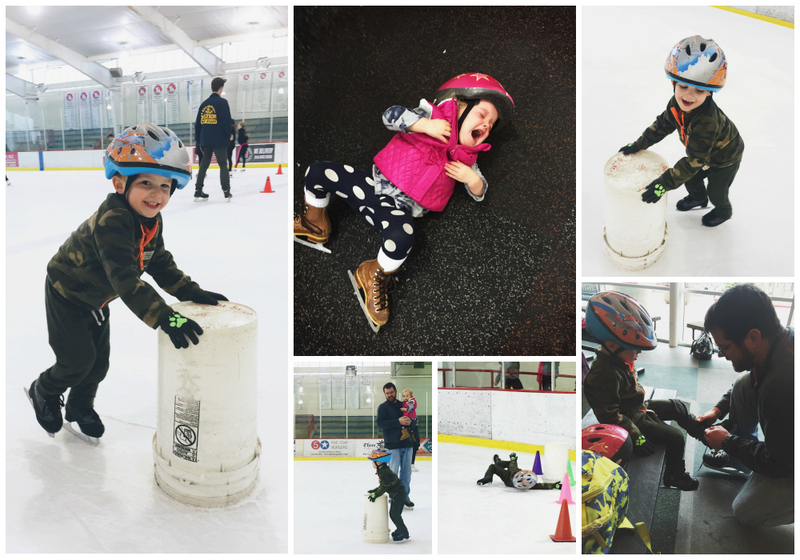 Ryan and I took the kids ice skating last weekend. It was the first time for both of them and I really wasn't sure how either kid would handle it. Mac was a rockstar on the ice! I couldn't believe how well he handled himself. I know he's a very coordinated and athletic kid, but I was super impressed with how well he handled falling and what a fantastic attitude he had about not being good at something right away. Every time he fell he'd get right back up and say how much fun he was having and how he's just going to keep practicing and get better. I don't handle being not good at something, so he certainly doesn't get that go-getter enthusiasm from me. It was amazing to watch and I've never been so proud. Mim, on the other hand, was not a fan of ice skating. At one point she just threw herself on the ground and kicked and screamed. That she definitely gets from me. THREE. The kids have been really into Christmas lights this year. They absolutely love seeing lights on houses we pass while driving and on the homes on our street. Last week while Ryan was out of town, I surprised them with a fun drive through Santa's Magic Kingdom at Jellystone Park. We had an early dinner, got dressed in our jammies, swung by Dunkin Donuts and picked up hot chocolate and donut holes and headed out to the park. It's about a 20 minute drive from our house and they did great in the car. Once we got there, they got out of their seats and sat up front with me, while we blasted Christmas music from the radio and ate ourselves into a sugar-frenzy. 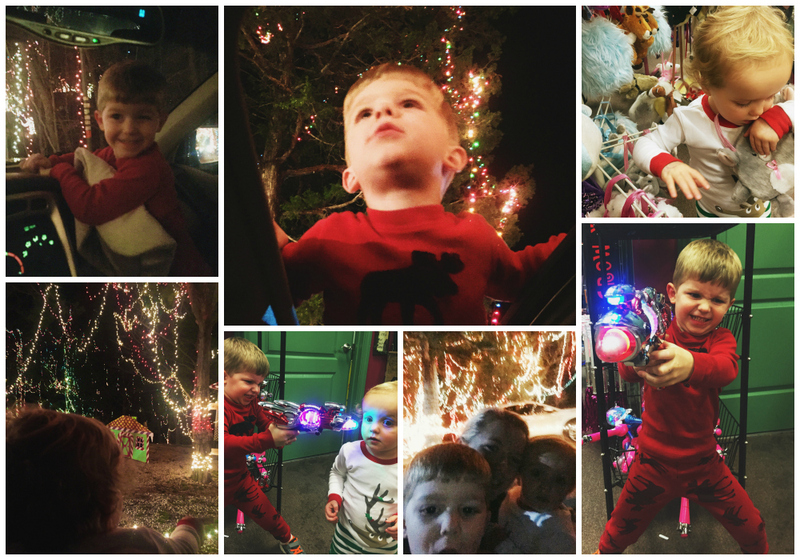 At one point both kids were climbing on me while hanging out of the sunroof gawking at the overwhelming display of lit-up Christmas weirdness. It was so strange, but so much fun! Mac ate 9 of the 12 donut holes and literally almost bounced himself out of the car. FOUR. 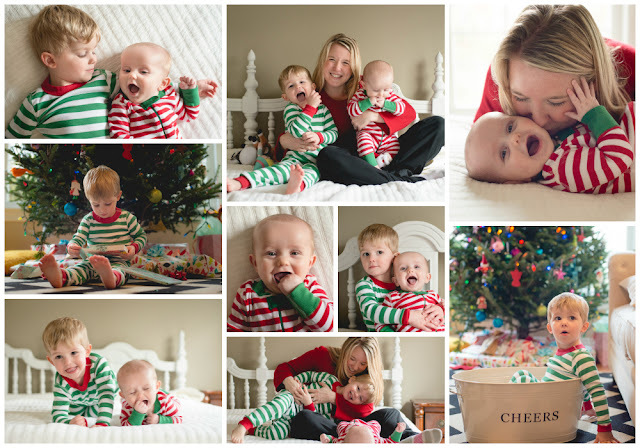 Can we take a minute to talk about just how cute and little the kids were last year? Every year I make a photo calendar of the kids using all the photos I've taken (and we've had taken) over the past year and these are the photos that are staring at me this month. I can't get over the cuteness. FIVE. And speaking of little and cuteness, I'm just going to leave this here. I can't even. How were they ever that little??? We are going to drive through the Shrine tonight to see Christmas lights, I hope Jude likes it!! SO FUN!!! 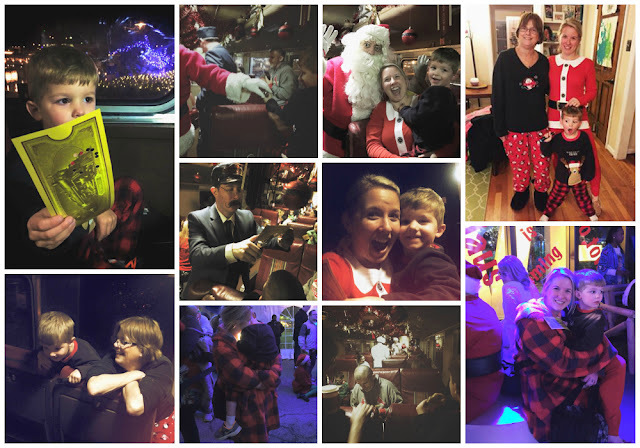 I love that you, your mom and Mac got to go on the Polar Express together! He must have lost his mind in excitement. And then to go ice skating (you are one brave mama! I know I would eat it and I don't even want to see how Mason would be lol) and go see Christmas lights (and eat donuts!!!). Can I come live with you?? "I believe!" Love it! And go Mac go on the ice skates. I took Liam last year, and he was into it but not awesome at it. He is much better on skis. I'm hoping to have him in the mountains a ton this winter. Time is such a little devil - why do they grown so dang fast?! My sister took her kids to some magical Polar Express thing in Arizona. Apparently it's all there is in this town and it's supposed to be magical! Have a wonderful weekend sweet girl! LOVE Mim on the floor - real life! ;) Happy weekend, friend! I need to find a Polar Express type activity near us!! It looks like so much fun. :) love the pictures of the kids. Your pictures are always so good! Mim on the floor with her skates... I'm dying! Friends of ours suggested skating while in NYC and we just said not gonna happen. Chris and I don't even feel comfortable on skates (I'm a bad Canadian I guess) so we weren't gonna test it out with Noah while tourists are all watching! I love the bucket idea! Noah saw a Daniel Tiger episode where they do it and now he wants to go! That last picture...SO CUTE. I love that you went and looked at lights in Christmas pjs..so fun. The Polar Express looks and sounds like it was so much fun! I wish we had something like that here! "I believe, momma." Oh my gosh, does your heat explode each time?!! Ice skating - I'm with Mim (and you). If I'm not good right away, pass. Those pictures! Gahhhh!! The cute. It's too much. Dying.